Pre heat the oven to 350 F. Place all ingredients into a bowl and mix to combine. Place the seeds on a baking sheet and bake for 20 minutes, stirring halfway. The pumpkin seeds should be slightly browned and crunchy. Eating a healthy breakfast is very important. It gets your metabolism started, gives you energy long term energy and helps you to make smart choices though out the day. This recipe for banana oatmeal bars is an easy way to get your fruits and whole grains while on the go. This is also a fantastic recipe for young children that are picky eaters. Place all of the ingredient into a bowl and smash together to combine. Spoon 1-2 tbsp. portions onto a foil lined baking sheet and bake at 375 F for 15-20 minutes. Allow the bars to cool completely and remove from the baking sheet. These will last 1-2 days before they spoil. Soft pretzels are an incredible treat. They can be dipped in cheese sauce, ranch dressing, marinara, crab dip and even sprinkled with cinnamon sugar. Most of the time a soft pretzel will come from a roller rink, ball game or the movie theater. A pre cooked, then frozen, then re-thawed and then semi baked, big pile of gross. 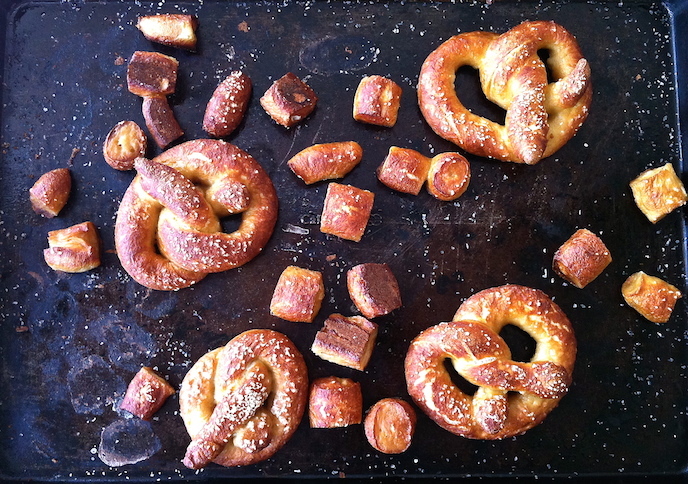 But how could you get a perfectly toasty, chewy, crusty soft pretzel in your own home? Well, the answer is right before your eyes. We start this recipe out by purchasing pre made pizza dough from the store, at the outrageous price of $1.99. Then you simply roll and twist anyway you like. Next you will boil the dough in a pot of water and baking soda. The baking soda will give you that dark and chewy crust only found in pretzels. After that you salt em' and pop them in a super hot oven for 15 minutes to finish cooking the dough inside while browning the outside. Frozen burritos used to be one of my favorite I just got home from work, school, or after a late night meal. They are cheap and easy to cook. However good they are no good for you. They have too much fat and salt and not enough protein and flavor. There are other burritos on the market but they are kind of lightweight, don't have enough flavor and are expensive, up to $5. Given this sad state of affairs, I decided to make my own burritos, wrap' em up and freeze them for those cold and lonely night. This recipe is very easy and can be switched up to include cooked vegetables, chopped meat, and pretty much anything else you can think of. I like to start out with big, 12 inch burrito size flour tortillas and fill them with a base of cooked rice, beans and cheese. This recipe cost about $15 and will make 8 hefty size burritos, filled with good stuff and will satisfy your comfort food cravings. Place all of the ingredients into a bowl, mix until combined and place in the freezer for 20 minutes. Microwave the tortillas until to soften them, about 30 seconds. Lay the tortillas out on a flat surface and place one (1) cup of the bean mixture on the tower third of the tortilla. Fold the bottom portion over the filling, tuck in the sides and finish rolling until the package is tight. Rest the burrito on the seam side. Double wrap the burritos tightly in plastic wrap and freeze until solid. To cook the burritos, unwrap them from the plastic and microwave on a plate for 90 seconds. Turn over and cook for 60 seconds, turn again and go for 30 seconds more or until the burrito is hot. I like to finish the burritos off by browning them in a medium hot skillet until toasty on both sides. All you have to do is pre heat a skillet, add a teaspoon of oil, when it smokes, place the hot burrito in the pan and cook for 2 minutes, turn and repeat. Fresh guacamole, crispy tortillas and a cool beverage is the best way to start a relaxing evening. Guacamole is a mainstay in texmex cuisine and can be used as a refreshing condiment for tacos, salads, chicken and fish. The avocados in guacamole are filled with vitamin, nutrients and healthy fats that are great for healthy skin, hair and nails. This recipe can be made in minutes and you can try some of the mix in options below to suit your tastes. Place all of the ingredients into a bowl and smash together until chunky. Keep refrigerated until service. I love this recipe for baked tortillas chips. They are cheap and easy to make and are a healthy alternative to fried potato and corn chips. The best thing about these chips is that they are strong and hold a lot of dip. Try sprinkling the tortillas with cheddar, jack or parmesan cheeses for extra flavor. Pre heat the oven to 350° F. Cut the tortillas into 8 pieces and spread out on a baking sheet. Quickly spray with oil and season with salt and pepper. Bake for 10-12 minutes or until crispy and brown. Well, It's been several years, but my show Cooking with Egg is back on track. Check out my first episode called "Fruit Cups". I shot this in Silver Spring with my buddy Wanakhavi and finished it up with an awesome new filmmaker out of Baltimore named Brian Morrison of Wood Room Cinema. Big shout out to the Foley Family for letting me takeover their kitchen for the day. In this episode I am going to teach you how to make a fruit cup for everyday of the week. Sharpen your knives and lets get crackin'!